This entry was posted in Madwort Sax Quartet, News on September 11, 2012 by cath. So, the surprise gig mini-cluster happened and it was a lot of fun. Here follows a brief writeup with the obligatory grainy phone photos. 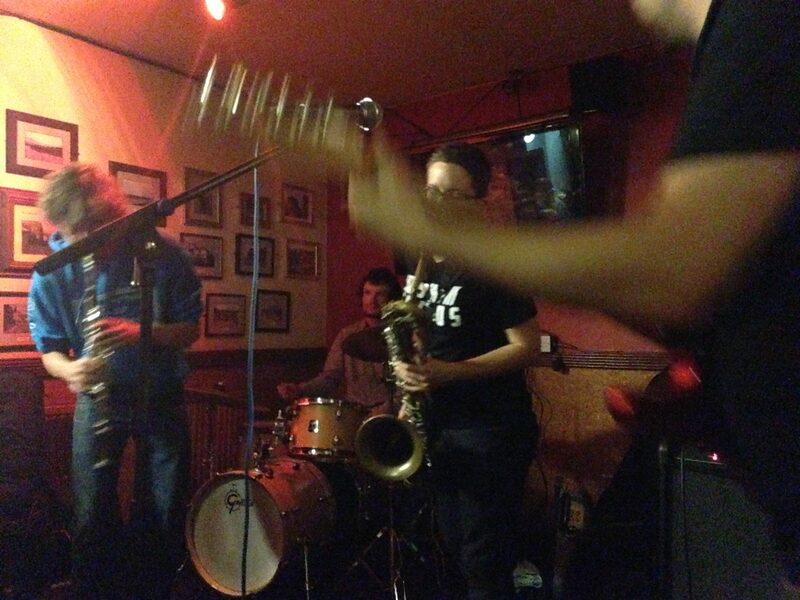 The Madwort Sax Quartet gig at the Salisbury on Sunday came out of the blue, when another band had to drop out. With only a few days to go we found ourselves on the bill with the Euan Palmer Quartet, who were coming down from Birmingham for the gig. Tom called a rehearsal on Sunday afternoon, then we all ate a Thai curry and headed up to the venue. I was a little bit concerned about audience numbers, as we’d only had a couple of days to roll out the aggressive marketing campaign (I even attempted a group text – accidentally sent it twice), but actually I needn’t have worried because there was a nice turnout. The Salisbury gig seems to have a regular crowd now (people were saying that our gig was a typical one in terms of numbers), and it was great to play to a room of ‘randoms’ along with some of our friends who’d come to check out the band. The set went well and the audience seemed to be into Tom’s music. The group definitely works in a live context, which is good to know (!) – and this was without straying into the realm of group improv. We found that we’d internalised all the tunes from the recording in July – they were definitely still ‘in there’ after a month off. All in all, a successful debut I reckon! Tom seemed really pleased. 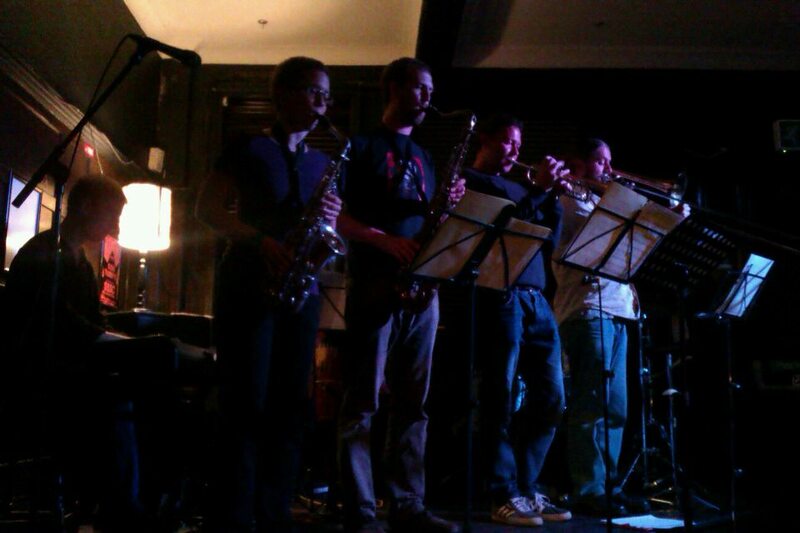 Next up was last night’s Quadraceratops SE Collective gig at the Amersham Arms, down in New Cross. I had originally planned to have some new material ready for this gig, but didn’t manage to finish anything in time. It ended up being a good thing though, in a way, as we spent some rehearsal time the day before working on opening out the existing tunes. Again, I was worried we might play to an empty room, but was proven happily wrong for a second time! There was a very friendly little crowd complete with load clapping and whooping, and the band seemed to go down really well. I even had some ego-boosting compliments about the writing afterwards. The SE Collective guys are a lovely bunch and the back room at the Amersham, usually pretty huge, becomes a nice intimate venue thanks to a velvety jazz curtain. Also, the sound on stage was great, without any mics. Best gig so far I think, and gig number four. Here’s Kitty Ward’s photo of us, our music helpfully illuminated by the atmospheric and homely stage lamp…Luke and Dave are there too; you just can’t see them. I’m in the middle of sorting out the next few Quadraceratops gigs, so I should have something to post up about one of them soon. I’m also going to be getting down to work on some new tunes, to extend the set and give us a bit of flexibility. Nice as our adopted Zappa tune is (‘Blessed Relief’), it would be good to have two full sets of my own stuff. So. Onwards! 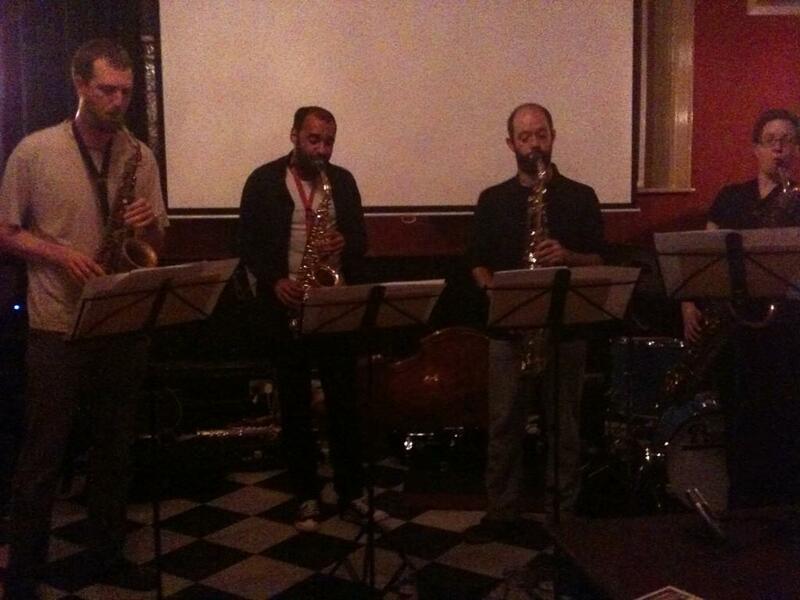 This entry was posted in Gigging, Madwort Sax Quartet, Quadraceratops on September 5, 2012 by cath.